A 9.0 earthquake could last 3-5 minutes, compared to the 30-45 seconds of smaller, routine quakes. Approximately 100,000 Portland single-family homes are potentially vulnerable to a major earthquake, according to city figures. Un-reinforced masonry buildings are the most vulnerable, along with structures that have high centers of gravity, such as lift bridges. People on Hayden Island could become stranded since I-5 is the only road off the island, although the southern slough bridge has a better chance than the main lift bridge. It addition there are lots of boats around. 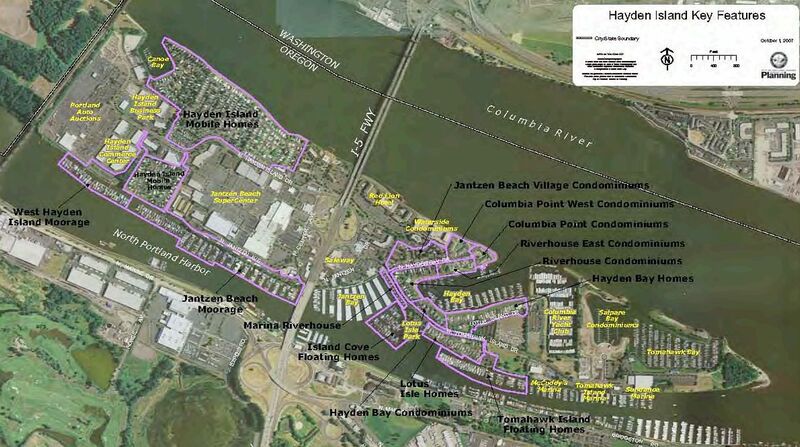 Hayden Island is built on sandy soil, so liquifaction may disrupt roads, crack sewer, water and natural gas pipelines, down power and communications lines and cause damage to manufactured homes and condos if they fall off their foundations. Mobile homes and manufactured houses are commonly not bolted to a foundation. Instead they rest on concrete blocks that are likely to collapse during even low horizontal accelerations. This will cause the house to flop down onto its foundation. The house could be prevented from sliding off its blocks during an earthquake by replacing the blocks with a cripple wall and securing it. This may make the house insurable against earthquakes, but it’s not cheap. An Earthquake Restraint Bracing System (pdf) may help. Here’s a mobile home installation guide. Mobile homes are 2-5 times more vulnerable than woodframe houses. In strong shaking, 95% of unbraced mobile homes can fall off their foundations. In 3 mobile home parks in the Northridge earthquake, 1 in 7 mobile homes burned. According to OSU, chances are two out of three that you’ll be at home when the next big earthquake strikes, and one out of three that you’ll be in bed. If you are an owner or even a renter, you can take steps to make your home safer against an earthquake. Secure your waterheater using heavy-gauge metal strapping and replace all copper and metal piping with flexible natural gas and water line connectors. Strapping kits make this pretty easy. Stove. Anchor a stove built on a brick hearth with three-eighths-inch diameter bolt. A Flexible gas connection to your Mobile Home helps. Propane Tanks. (1) Bolt the four legs of the tank to a concrete pad. (2) Install flexible hose connections between the tank, the supply line, and the entrance to your house. (3) Tie a wrench near the shut-off valve, and make sure all family members know how to use it. Plan with your neighbors for emergencies. DO NOT enter the building if there is smoke and/or fire. Use fire extinguishers and garden hoses as needed. Send someone to meet fire truck(s) and assist in directing fire location. The fire department has an emergency code and gate key for access. Secure deck furniture, boat tie downs, plant containers, etc. Tip taller plants/trees over. Check float tie-ups and chain connections. the location of the nearest fire extinguishers. Be prepared with safety ropes if needed. Assist neighbors. Know how to contact them if they are away. Attach rope to cleat or stringer and secure to dock or piling, etc. until help can arrive. Turn off electrical breaker, gas and or water at walkway and report problem to utility company and moorage office. Northwest Natural Gas will be notified of any gas leaks. They will turn off the gas service if they feel it is too dangerous or can’t repair a leak. NWNG will determine the appropriate action to take. Moorage staff will contact Row Captains to help notify residents in the event an evacuation is mandated. exit by residents leaving the moorage and easy access for emergency personnel. Check with Coast Guard advisories before taking action. If offshore evacuation is the best option for your vessel, proceed to a staging area greater than 30 fathoms (180 ft). Go upriver, but DO YOUR HOMEWORK first. There won’t be time to outrun a Cascadia tsunami but the surge will dissipate as you go upriver. Do not return to local ports until you have firm guidance from USCG and local authorities. Local ports will sustain heavy damage from a local tsunami and may not be safe for days, weeks or months. Develop a personal evacuation plan for handling emergency situations. Carry a card with emergency/cell phone numbers of family members. Have a key contact/phone number of an out of state family member. Gather survival kit/emergency supplies, as necessary. Follow direction of emergency personnel as required. Know common First-Aid procedures (including CPR). Know how to turn off utilities and operate safety equipment such as fire extinguishers.